"In their book Hypochondriasis and Health Anxiety, Jonathan Abramowitz and Autumn Braddock present a comprehensive, evidence-based psychological approach for treating health anxiety that can be modified to address individual treatment needs. "Chapter 8 is "Appendices: Tools and Resources." The appendix is one of my favorite aspects of this work, and is well worth the modest price of this book. The authors include worksheets for assessment, self-monitoring of body symptoms form, a symptom record, exposure hierarchy form, and an exposure practice form. Handouts for the palient include information on "our noisy bodies," the fight-or-flight response, common thinking patterns in health anxiety and tips for successfull exposure. These handouts are invaluable for clinicians to use in a busy practice. [...] In summary, I thought this book was very easy to understand for clinicians [and] in a very concise, easily digested format." "This volume in the Advances in Psychotherapy series is a practical guide to cognitive-behavioral therapy for hypochondriasis and health anxiety complete with illustrative case vignettes.[...] The authors provide a surprisingly in-depth look into the state of the field. The books in this series are great supplemental tools, references, and primers. All mental health professionals will find this book worthwhile, and primary care physicians may find it especially helpful if they have patients with health anxiety. The series is well regarded for both its academic and clinical applications." "Health Anxiety by Jonathan Abramowitz and Autumn Braddock is a concise, informative, up-to-date and immensely useful clinical guide to understanding and treating people suffering from worries and catastrophic fears of illness. 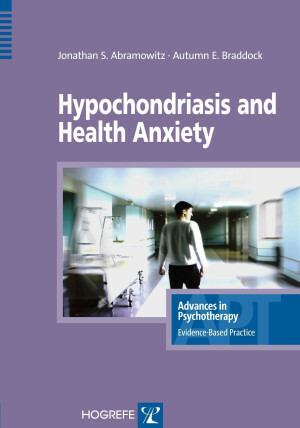 The authors provide a focused review of how health anxiety is manifested in various disorders and how differential diagnosis can be made (e.g., somatization disorder, OCD, generalized anxiety disorder, etc.). I particularly liked the description of assurance-seeking, body checking, safety signals and avoidance that help perpetuate this often refractory condition. The reader will find several useful self-report forms, recommendations for medication (and the downside of medication), clinical pointers in diagnosis and conceptualization, an excellent sophisticated cognitive-behavioral model of health anxiety, and a detailed case example. Throughout this concise and clearly written book the reader will find user-friendly tables that quickly summarize the "go-to" approach that CBT allows. I highly recommend this book and will use it in training therapists in dealing with this often intransigent problem." "In this much needed volume, Abramowitz and Braddock share their masterful knowledge of health anxiety using an easily accessible yet exquisitely elegant framework. State-of-the-art essentials of providing empirically-based treatment for this often difficult to treat condition are covered in a clear and concise manner that is certain to facilitate positive outcomes. Clearly an invaluable resource for all clinicians providing care to those struggling with excessive anxiety regarding their health."